Smart Menu. Once you know where your springtime shindig is taking place, the next item on any party planner’s checklist will be food! By buying local and in season you can keep the planet on your VIP list. Open face finger sandwiches, grass-fed grilled meat skewers, and seasonal fruit salads, all from products found at local farmer’s markets can make a delicious eco-friendly spread perfect for the spring. Find some delicious springtime recipes along with some organic wine and locally brewed beer and dazzle your guests with a delectable and responsible lineup! Earth-friendly Party Supplies: Now that your green menu is taken care of, its time to think of basic supplies. Staying away from plastic and styrofoam plates, cups and utensils is an eco-conscious must. Party suppliers like Susty Party and Green Party Goods offer creative sustainable products that make a decorative statement while making a socially responsible one. In general, choosing bamboo or recycled wood and/or compostable supplies make a difference while bringing your springtime party to life. Another fun and affordable option is asking a few guests to bring 3 or 4 pastel colored plates and cloth napkins from home. The eclectic array of dishes and napkins will add a fun vintage spring feel to your party! No Waste. Festive recycling bins for guests can guarantee that party trash doesn’t end up in a landfill. Decorating large flowerpots or metal bins with hand-written cardboard or chalkboard “glass, plastic, waste” signs brings your guests in on the eco-fest and adds a clever detail to your spring theme. Don’t forget to call a local food bank in advance to coordinate the drop off leftover food. Green Décor. Make your party pop while keeping the environment first. Household items like throw pillows on chairs, mason jars, used cans to hold utensils and drinks, and sheets as tablecloths enhance the spring theme in creative ways. Potted plants can make a great centerpiece as well as a nice party gift for guests. If you’re into DIY decorating, consider classy paper garland or colorful and creative yarn chandeliers! Looking to purchase something? Order some biodegradable balloons in fun spring colors or eco-friendly floral tablecloths. You’re green fest will be the talk of the town… and the planet! 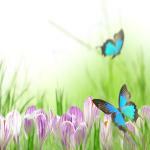 How do you keep Mother Earth happy at your springtime events? Tell us on Facebook, Twitter or leave us a comment below! 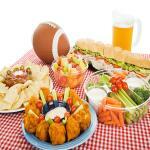 Hosting Super Bowl Sunday Party? Try These Easy Recipes!